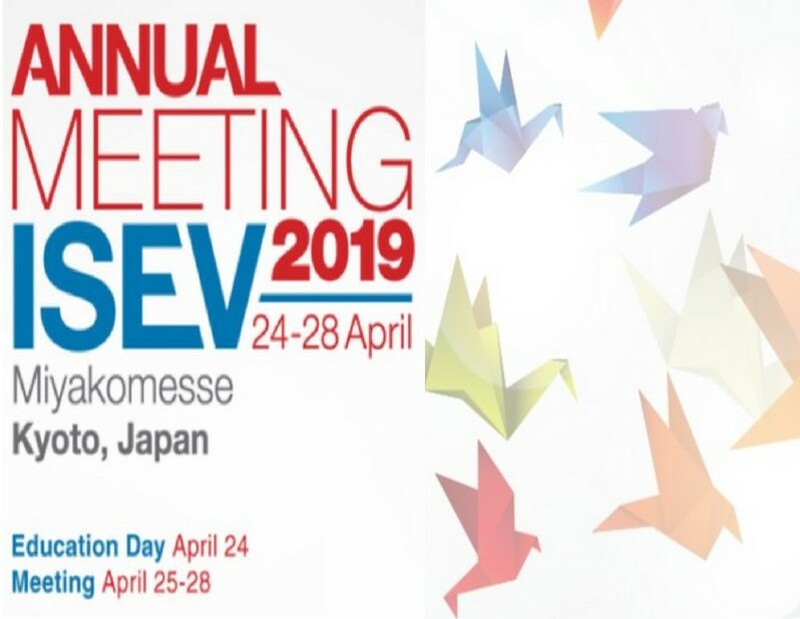 Marca Wauben (Utrecht University, Secretary General of ISEV and part of the Organizing Committee of ISEV2019) will chair the “Plenary Session on RNA” (27th April). Lucia Paolini will present two posters: “Fourier-transform Infrared Spectroscopy (FT-IR) to fingerprint EV subpopulations as a whole” and “Taxonomy of individual EVs by nanomechanics” at the “Advances in EV Quantification and Characterization” poster session (27th April). 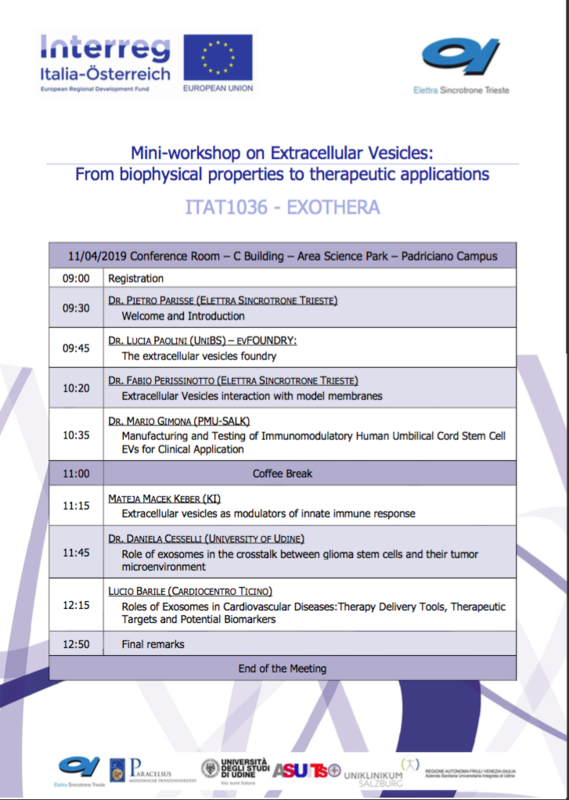 On Thursday April 11 Lucia Paolini (evFOUNDRY personnel, CSGI) gave an invited talk at the “Mini-Workshop on Extracellular Vesicles: from biophysical properties to therapeutic applications” within EXOTHERA project funded by Interreg Italia-Österreich programme. The talk presented “evFOUNDRY: the extracellular vesicle foundry” project (see flayer for details). 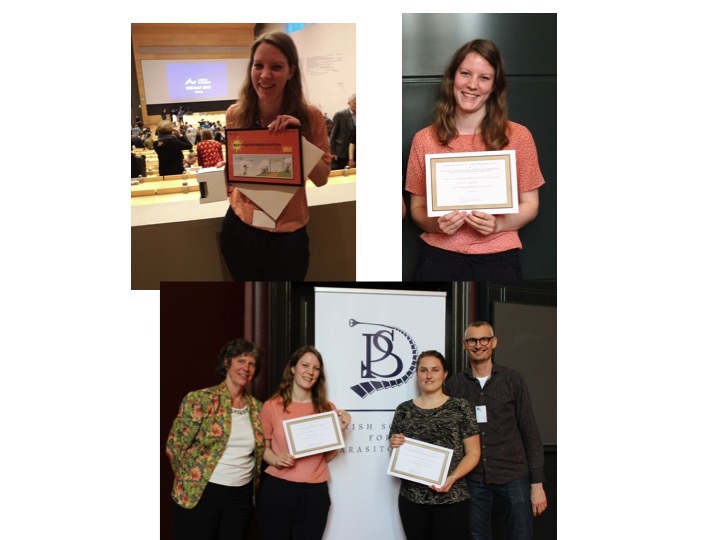 First, she was awarded ‘best poster presentation’ at the PhD day, 2019 at Aarhus University and secondly she was awarded the ‘young scientist award’ for best poster presentation at the Spring Symposium 2019 in Copenhagen hosted by the Danish Society for Parasitology. On March 27th-29th 2019, the evFOUNDRY team met in Lund (hosted by LINXS - Lund Institute of Advanced Neutron and X-ray Studies http://www.linxs.lu.se) to review the first 6 months of activity and plan next moves. The meeting saw for the first time the participation of all the involved young researchers (see picture, from the left Karolina Mothander (Sweden), Lucia Paolini (Italy), Richard Gillams (UK), Andrea Ridolfi (Italy), Anne Borup (Denmark), Anders T Boysen (Denmark), Costanza Montis (Italy), Francesca Loria (Estonia), Bao Dang Ho (Sweden), Martijn van Herwijnen (The Netherlands) not in the picture). 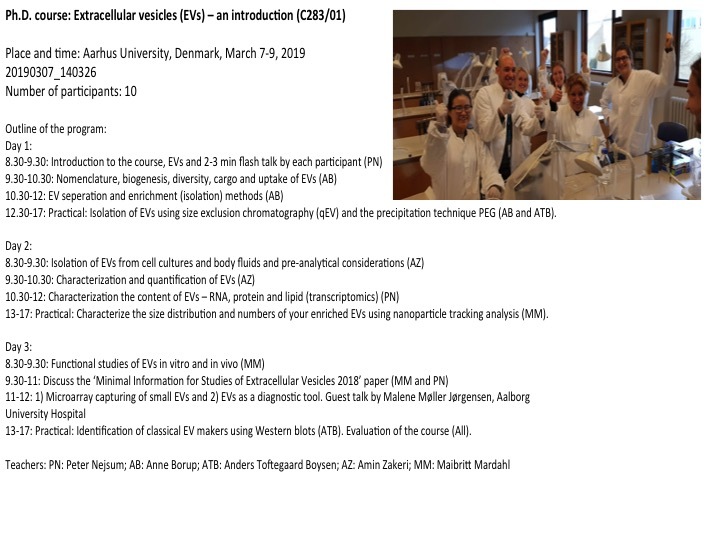 Members of the Evfoundry consortium have taken the initiative, and for the first time, been running the 3 day long Ph.D. course 'Extracellular vesicles (EVs) – an introduction' at Aarhus University, Denmark, March 2019. There were 10 participants from different universities in Denmark. The participants were introduced to EVs and different aspects of EV biology and how to characterize and explore the function of EVs. During the laboratory exercises the participants enriched for EVs and characterized their sizes and numbers and finally, used western blots to identify specific markers of EVs. 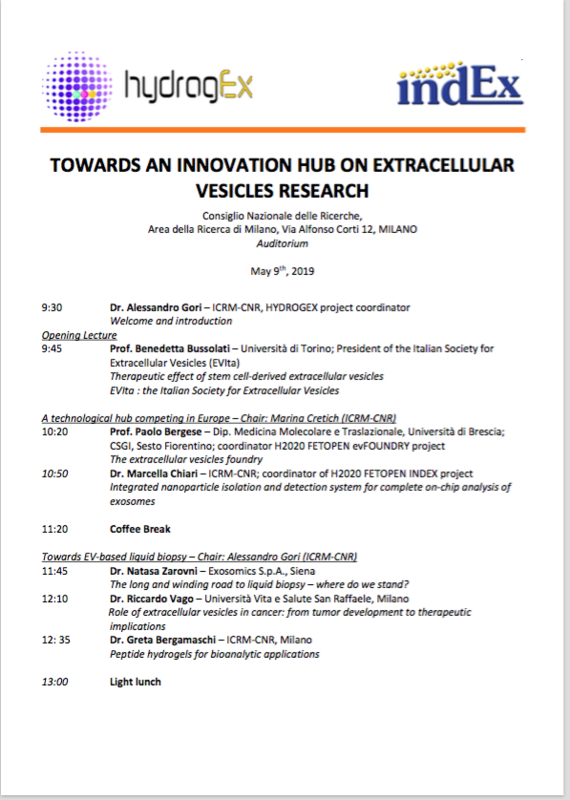 evFOUNDRY will participate to a kick off event for establishing an innovation hub on extracellular vesicles in Lombardy Region. 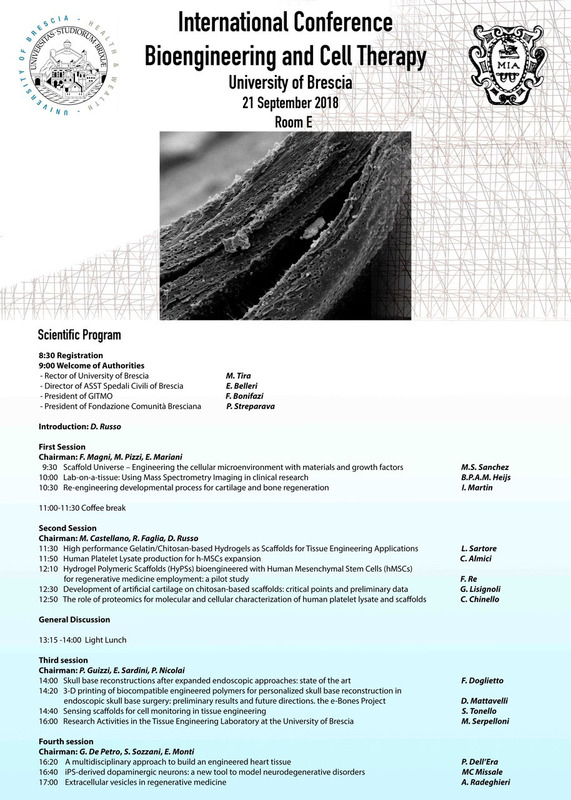 The meeting will be held on May 9th, 2019 in Milano (see flyer for details). Annalisa Radeghieri (evFOUNDRY personnel) has received 120,000 euro (approximately USD 137,000) in funding in the framework of an Italian Education and Research Ministry (MIUR-PRIN) grant. The project aims at “Development of biotechnological nanoparticle platform for the delivery of antitumor therapies using Patient Derived-Organoids library of Breast cancer”. It brings in collaboration University of Milano-Bicocca, University of Milan, National Research Council and University of Rome Tor Vergata. Professor Peter Nejsum (evFOUNDRY personnel) receives million-funding for development of new treatment method. 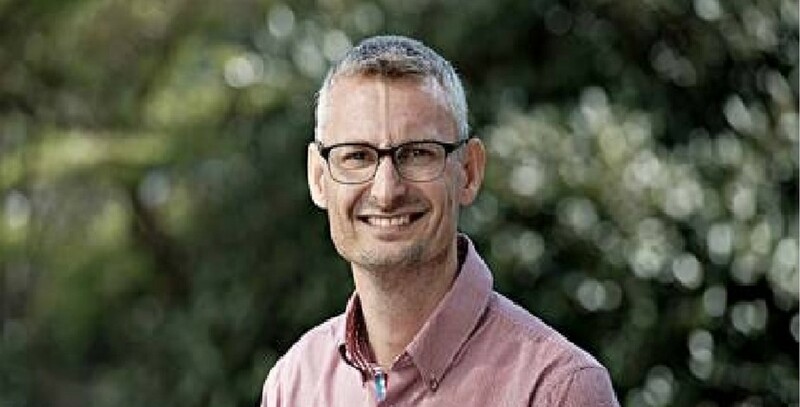 Danish Professor Peter Nejsum (evFOUNDRY personnel) has received DKK 3 million (approximately USD 457,800) in funding for a project to develop a new method to diagnose and treat diseases. The aim is to discover new immunotherapies and diagnose cancer through blood tests. But first step on the journey goes to the local abattoir to collect a bucket of roundworm. Processing large volumes of EV sources. 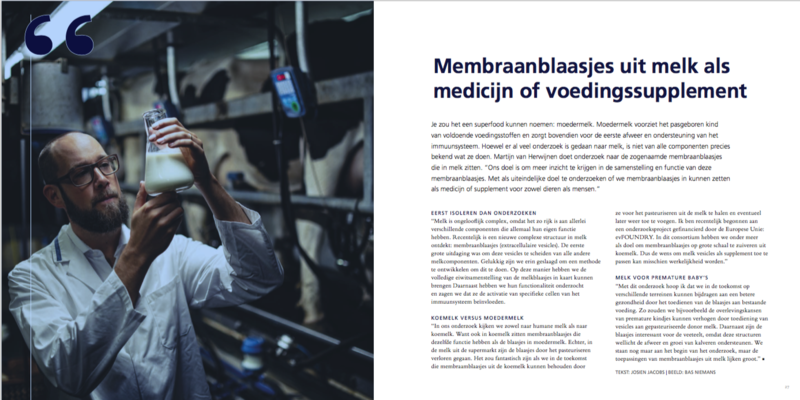 First study supported by evFOUNDRY published on Cells. Sara Busatto and Paolo Bergese (evFOUNDRY PI) co-authored with Joy Wolfram and colleagues from the Mayo Clinic and the Houston Methodist Research Institute a paper on the use of tangential flow filtration (TFF) for highly efficient concentration of nanosized EVs from large volumes of fluid. The study contributes to evFOUNDRY effort in exploring methods for robust massive separation of EVs based on size. Debora Berti, member of the CSGI team has been appointed in the Editorial Board of Advances in Colloid and Interface Science. 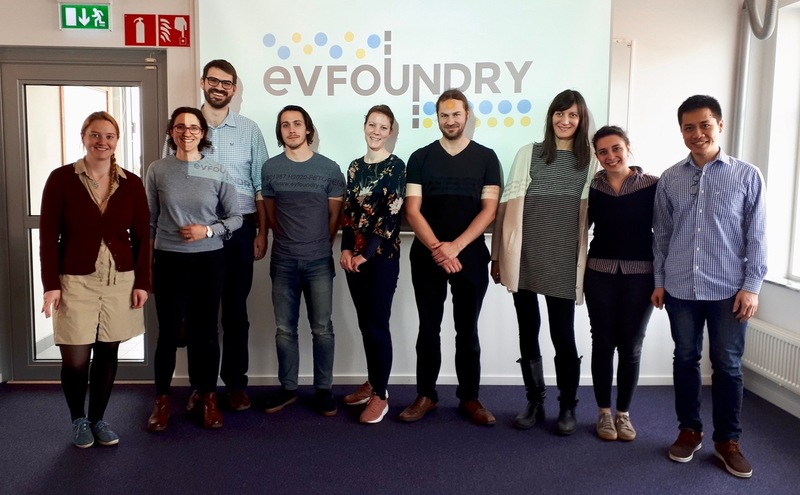 evFOUNDRY researcher Lucia Paolini was selected for the FET2RIN training course (three workshops from mid-December 2018 to mid-February 2019 in Brussels). 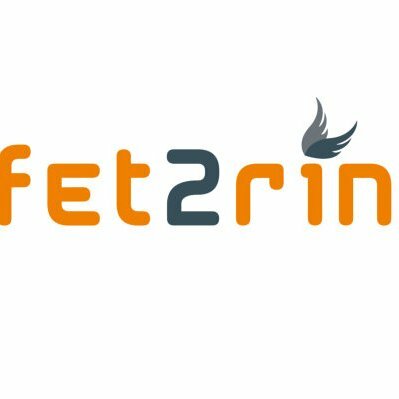 The training, in collaboration with META, European Crowdfunding Network (ECN), and European Business and Innovation Centre Network (EBN), will help to look at FET project from a business perspective, assessing its strengths and weaknesses on the route to commercialization (http://www.fet2rin.com/home). 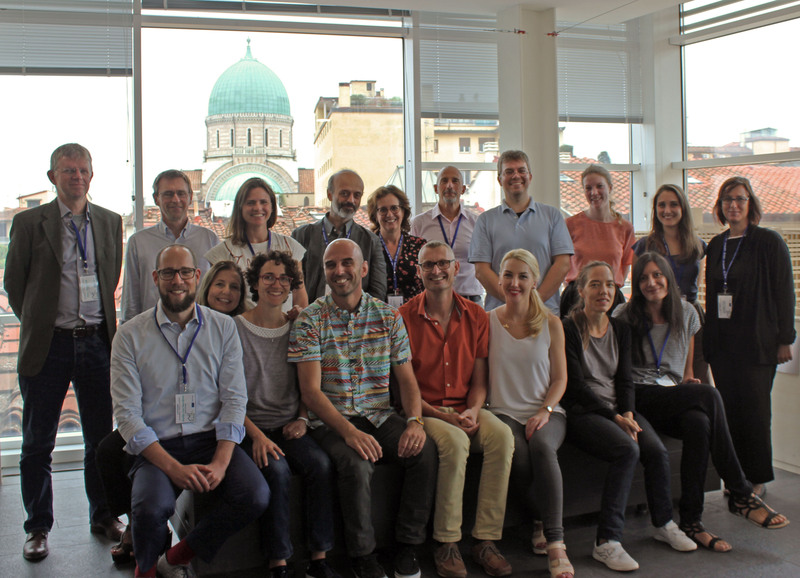 KICK OFF PARTNERS’ MEETING On September 12 2018, at Plesso di SANTA TERESA Florence, next to the workshop (https://www.quotidiano.net/blog/malpelo/ricerca-vescicole-extracellulari-come-taxi-per-farmaci-e-vaccini-33.2061 http://www.meetthelifesciences.it/it/archvio/831-nanotecnologie-evfoundry-nuovi-approcci-ed-utilizzi-delle-vescicole-extracellulari) it’s time for the partners meeting. 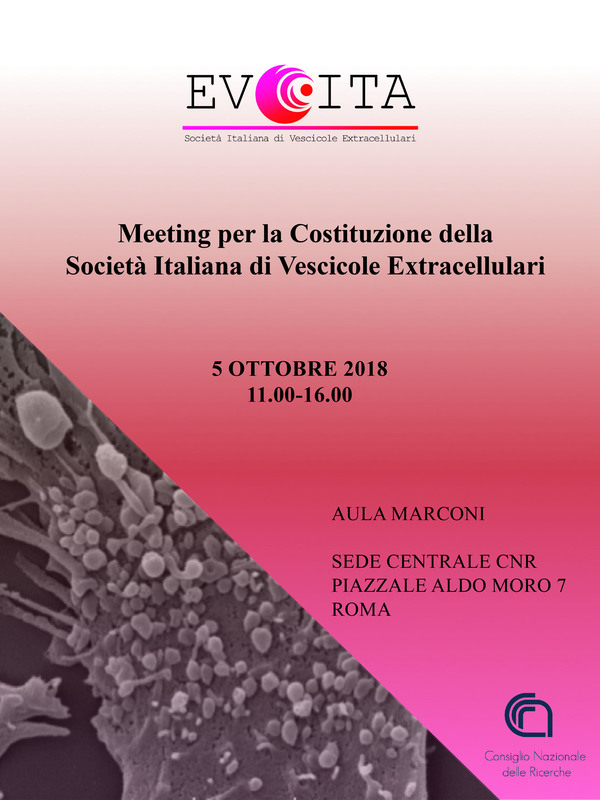 On October 5 2018, Lucia Paolini (evFOUNDRY recruited researcher) with Annalisa Radeghieri (evFOUNDRY personnel, CSGI), Natasa Zarovni (evFOUNDRY personnel, HansaBioMed Life Sciences) and Paolo Bergese (evFOUNDRY coordinator) will participate in the foundation of the Italian Society of Extracellular Vesicles - EVITA. The meeting will be held at CNR headquarters in Rome. 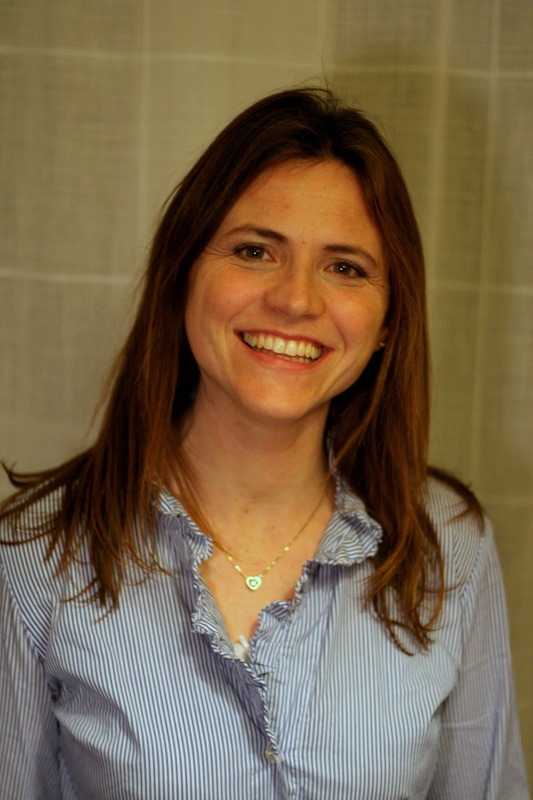 EVITA will connect leading Italian scientists from all the disciplines involved in EV research in the effort to advance EV research nationally and globally, in tight relationship with other EV Societies, including The International Society for Extracellular Vesicles (https://www.isev.org), the Spanish GEIVEX (http://geivex.org) and the American Society for Exosomes and Microvesicles (https://www.asemv.org). On Friday September 21 Annalisa Radeghieri (evFOUNDRY personnel, CSGI) will give an invited talk at the International Conference on Bioengineering and Cell Therapy. The talk will be focused on the potentiality of extracellular vesicles in regenerative medicine. 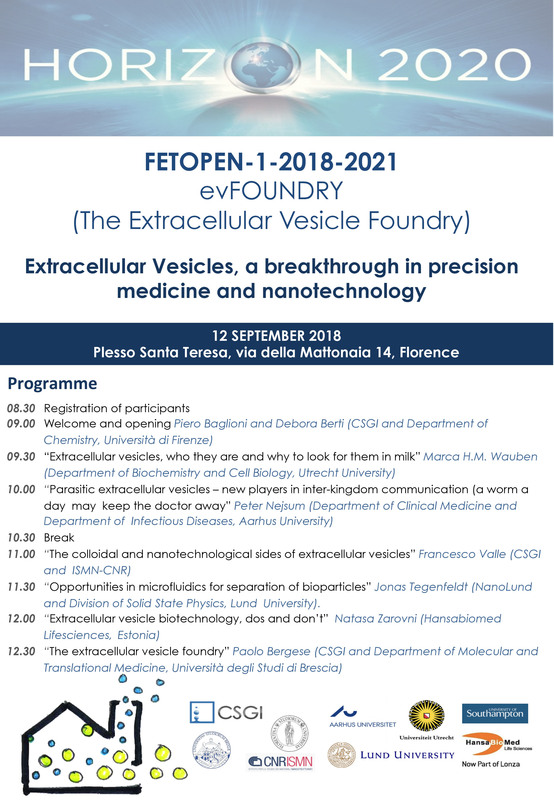 On September 12 2018, at Plesso di SANTA TERESA Florence , evFOUNDRY kicks off and opens to academic and non-academic communities with a free workshop on “Extracellular vesicles, a breakthrough in precision medicine and nanotechnology”, which sees the partners lecturing on their role and science in the project. Vescicole extracellulari come navette, consegnano farmaci e vaccini. https://www.quotidiano.net/blog/malpelo/ricerca-vescicole-extracellulari-come-taxi-per-farmaci-e-vaccini-33.2061 .